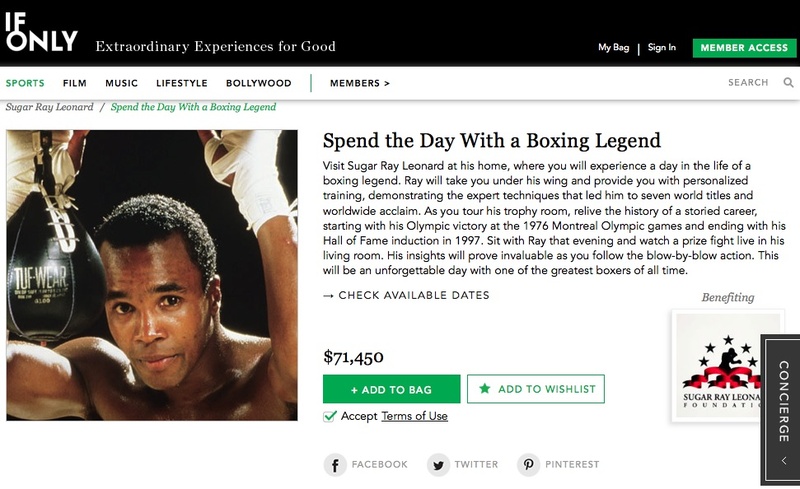 Want to spend the day with boxing star Sugar Ray Leonard? Or walk the red carpet for a Hollywood-style premiere? San Francisco-based IfOnly packages and sells those kinds of multi-thousand-dollar, A-list experiences, and it just raised $12 million from an equally exclusive group of investors. The round was led by New Enterprise Associates and included Khosla Ventures and Founders Fund, American Express Ventures and the Advance/Newhouse arm of Condé Nast. It also included angels like Yahoo (s YHOO) president and CEO Marissa Mayer, SalesForce (s CRM) founder and CEO Marc Benioff, Zynga (s ZNGA) co-founder Mark Pincus and investor Yuri Milner. The startup was founded last year by entrepreneur Trevor Traina, who launched product comparison site CompareNet and sold it to Microsoft (s MSFT) in the late 1990s. It offers all kinds of high-end experiences with “luminaries” in a range of fields, like sports, music and food. Through the site, people can purchase private dinners with celebrity chefs, sporting events with elite athletes or customized Gibson guitars and Harley-Davidson motorcycles. It also bills itself as a “charitable emporium” – at least ten percent of each experience fee will be donated to a non-profit chosen by the A-list host. The company said its roster of talent includes Kobe Bryant, Richard Branson, Andre Agassi, Joe Montana, Madonna and Shakira. The round comes amid rising interest in marketplaces and context-driven commerce – for example, earlier this summer, Greylock Partners said it had stepped up its investment in online marketplaces and, last month, Groupon (s GRPN) said it had acquired local experiences startup SideTour. =) this is such a great idea for the players involved.